I have to give credit, the new writer is really starting to capture the voices of those characters and they are starting to gel. Also I popped hard when they just decided to call the Avengers, although I feel Nico is going to fail at it. On that subject, I am now slightly confused what is the direction with Nico/Karo after the show decided to alter their relationship. Especially since I kind of dug the concept of Nico just being a really needy friend. 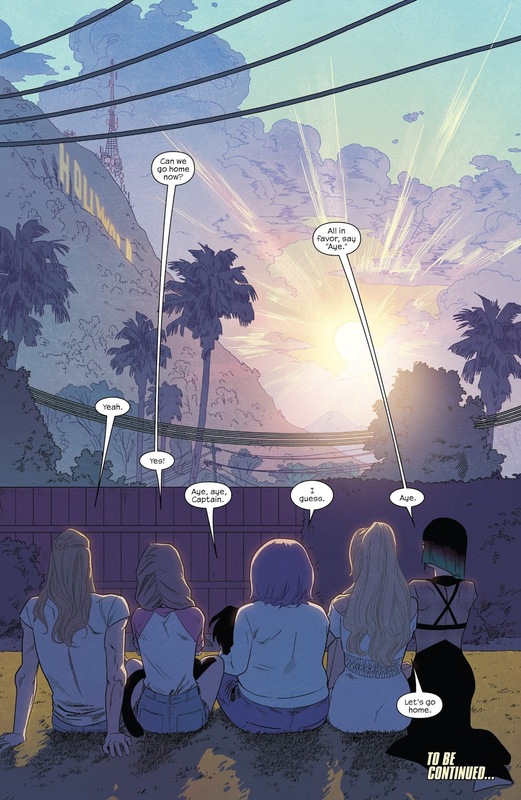 I really hope Nico/Karolina does not happen. 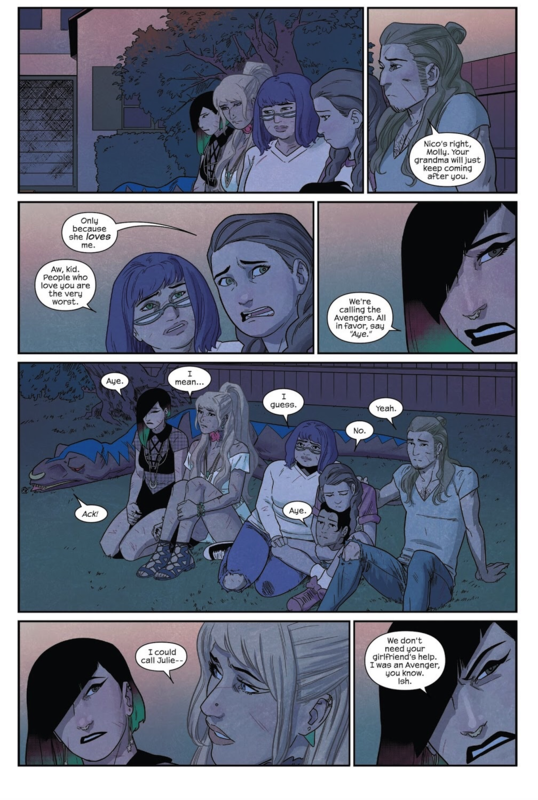 Partly because I like Karolina with Julie, but mostly because Nico needs to grow the #$%# up and stop hitting on her taken teammates. Completely agreed. That is why I liked the idea that Nico started hitting on Karo not because she's attracted to her, but because she's afraid of losing her. The show, though, does complicate things. I won't lie, I have been worried about this series ever since I saw the stupid manbun. Still, these scans are some of the best characterizations I've seen of the kids since BKV. This was an amazing issue. I think that in some ways Rowell actually deals with the difficult emotional topics that evil parents / abusive relationships bring up more expertly than Vaughan did. Molly trying to figure out how to choose her family and friends and judge the moral caliber of her grandma actually made me take a step back and think about my own defense mechanisms and whether they've stripped me of my humanity or not. And the ensuing exploration into the other kids' different takes on what fighting for each other and protecting each other and themselves means was also welcome. 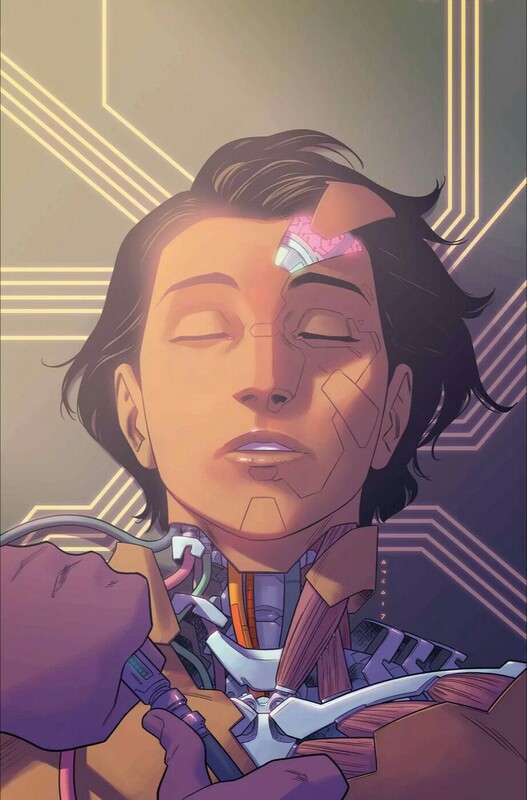 Nico's feelings for Karolina were always a canon thing in the comics, since going through K's clothes after her engagement to Xavin and subsequent disappointment when she found out they were still together. The poor girl never had a second chance since. 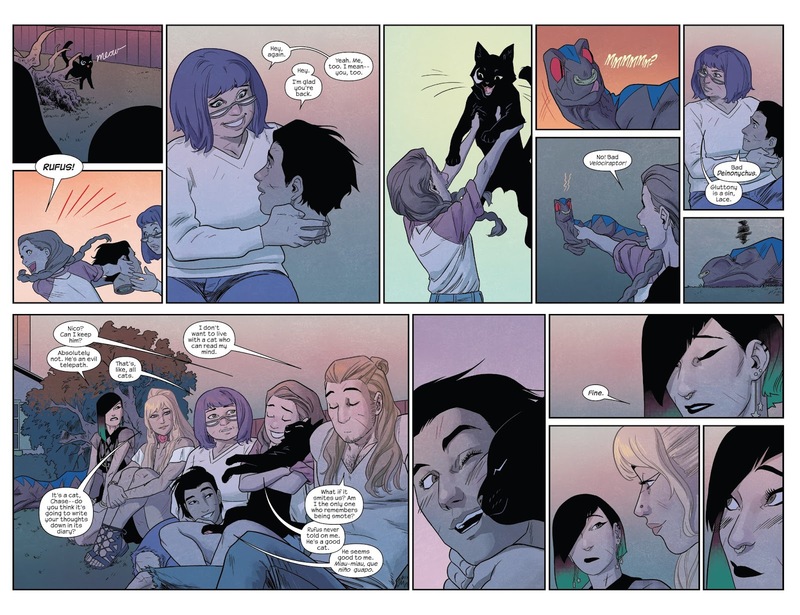 Nico's needy and insecure but in a really heartfelt way that is not worse than Karolina's flaw of oversimplification and affirmation. This is better than I expected.